Japanese Episode BW 042: "The Decisive Don Battle Match! Satoshi vs. Iris!!" American Episode 1442: "Club Battle Finale: A Hero's Outcome!" Satoshi defeats Dino, earning him a spot in the finals of the Don Battle tournament! The semi-finals continue with a battle between Iris' Kibago and Luke's Gobit. Kibago's attacks are mostly ineffective on Luke's Ghost-type pokemon, so it has no choice but to run away from its opponent's attacks. Just as it looks like Luke is going to win, Kibago begins to glow. Iris' pokemon has learned Gekirin and uses the powerful Dragon-type move to catch Gobit off-guard enough to knock it out. With that, Satoshi and Iris become the final two contestants of the Don Battle! Elsewhere, Nyasu tells his teammates that he has a plan to make sure no one interferes with their operations in Raimon City. Back in Raimon Town, Satoshi and Iris step onto the battlefield. 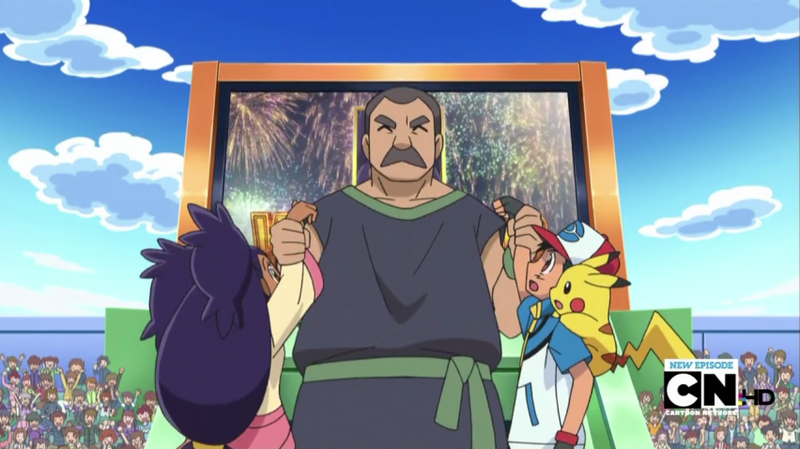 Satoshi's Pikachu is at a disadvantage because Iris' Doryuuzu is part Ground-type, but its trainer pushes through anyway. Satoshi's pokemon uses its speed and Iron Tail attack to damage its opponent while Iris' Doryuuzu focuses on pushing through with brute force. After a long battle that wears out both of its participants, the match comes down to a showdown between Doryuuzu's Drill Rider and Pikachu's Iron Tail. Doryuuzu's attack is stronger, knocking Pikachu back and allowing Doryuuzu to finish it off. As the crowd cheers, Iris is declared the winner of the tournament and receives the complete set of attribute-boosting Feathers! Later, Satoshi and his friends bid farewell to their fellow contestants as they return to their journey to Raimon City. So I'm actually not that bothered by Iris winning the whole tournament, believe it or not. Sure, the writers basically rigged the whole thing so that Iris would be handed a victory on a silver platter, and yes, it would have been more satisfying to see either Satoshi or Luke win instead. And I do agree that Kibago learning an attack as powerful as Gekirin instead of something more feasible like Double Chop is a bit much. But for some reason, I'm not as bothered by all this as everyone else seems to be. I dunno, I guess I've gotten so burned out by the writers having Satoshi beat opponents who have a type advantage so many times that I'm actually happy to see his Pikachu lose against a Ground-type. And really, what else could the writers have done and still have the starter vs. starter thing they were obviously going for? Turn the sprinklers on? Use some part of Doryuuzu's body as a lightning rod? Besides, I'm sure this is all a set up for Satoshi to beat Iris for his eighth gym badge. A victory at the Gym won't be as special if he already had a victory against her here, right? I liked the battle between Luke and Iris because a) the writers remembered that Normal-type attacks can't hit Ghost-types, something they always forget, and b) the scene where Gobit is chasing Kibago around with Gyro Ball at like the slowest speed possible is too hilarious for words. This was also the episode where I decided that I don't like Bel. I actually enjoyed her first few appearances, but the way she acts in the Don Battle tournament - especially in this episode - erases all that. She's not just a ditzy kid anymore. Instead, she's become this selfish jerk who treats Luke like crap and doesn't care about the feelings of the Zorroa she's obsessing over. Her next few appearances will get her back on my good side, but when this tournament was over and she stopped being a character who appears in every episode, I cheered. I always give the Rocket-Dan crap for being boring, but the trio in this episode they really made me laugh. Just what in the world are they doing in a stopped ferris wheel? How did they get up there? Did their car go all the way to the nine o'clock position and then the operator, forgetting that he still had customers onboard, shut it down and went home? Or did they somehow climb up into the car, using a giant ladder or a grappling hook or something? How did they get out? Why won't the writers tell us what we want to know!?!?!?!? Presentation-wise, I wasn't too fond of the animation in this episode because I don't like how they drew Iris. The music, on the other hand, was fantastic. All of these Don Battle episodes have had great scores and I think the music editors made the perfect choices when it came to scoring every single battle. Sure, this arc made me sick of that "Keep Going, Notch-Eared Pichu!" track from the Arceus movie soundtrack, but the rest of the music in this four-parter has been fantastic. This shot during the awards ceremony is so much creepier in the English version because Don George still sounds like Sgt. Hatred. So, there's that. There aren't that many of these this time! Luke: "Time for my star. That's...Golett!" Luke's battle cry in the Japanese version is ore no kyasutingu wa...kore da! (俺のキャスティングは　これだ！), or "The one I'll cast (as the lead of this battle)...is this one!" In the last episode, that got translated as "And here's the star of my show! Go, Larvesta!" but, as you can see, TPCI tweaked it a bit for this episode. For some reason, Bianca refuses to call Luke by his name in this episode, instead addressing him by the overly formal "Mr. Director," "Mr. Film Director" or "Mr. Filmmaker." I...I don't really know why, either. She had no problem calling him by his first name two episodes ago, so why the sudden change? In the Japanese version, Dent only speaks one word of French (chocolat) the entire episode. In the English dub, he seems to have been hanging around Burgundy too much as he speaks the language a lot more here. All the nonsense that Dent and Cabernet go on about during their Sommelier Showdown is more or less the same in both languages. The Japanese version talks more about how things are "bubbly" and have "acidic tastes" than the dub, but the two are otherwise the same. Ash: "Pikachu's just about to hit the wall." TPCI's translation here is fine, if you ignore the fact that no ten year old would ever actually saying this. 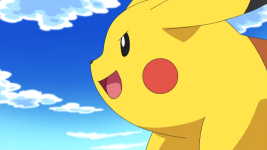 Originally, Satoshi just stated that his Pikachu's running out of strength. Freddy Omartian: "Here's the beautiful seven feather top class Driftveil wing set, containing Health, Muscle, Resist, Genius, Clever, Swift, and Pretty Wings." Takemitsu doesn't list out the seven attributes the way Freddy does.